These cities have some of the tastiest donut shops as celebrated by travel guides, food saveurs and locals alike. Happy #Nationaldonutday!! In honor of this yeasty special occasion and in the name of sprinkles and frosting, we give you our spread of cities where donuts reign as breakfast kings. From the unconventional to straight up confectionary, these cities have some of the tastiest donut shops as celebrated by travel guides, food saveurs and locals alike. Home to the Monster Mash of Donut styling, heading to Austin for a donut means you best bring an open mind and a very empty stomach. 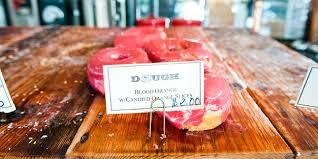 These donuts are not for the faint of heart (or the meat averse). The mad scientists over at Gourdoughs are famous for their massive flying pig, a feat of baconification. Remember those times when you dipped the crispiest bacon strip into maple syrup with a sly-guilty smile? That is basically this donut--go wild. If you're up to getting your donut freak on, try Donut Taco Palace II (There was a I?!?) where you can get a taco overflowing with sausage, egg and cheese. As a born and raised Bostonian, I fondly remember eating Dunkin Donuts' munchkins for many a classroom celebration. 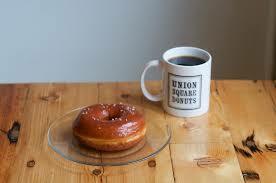 But oh how times have changed... Union Square Donuts has garnered national attention with their Hazelnut Crunch or Blood Orange options, a slight elevation from the wicked sick Dunkin' Munchkins). 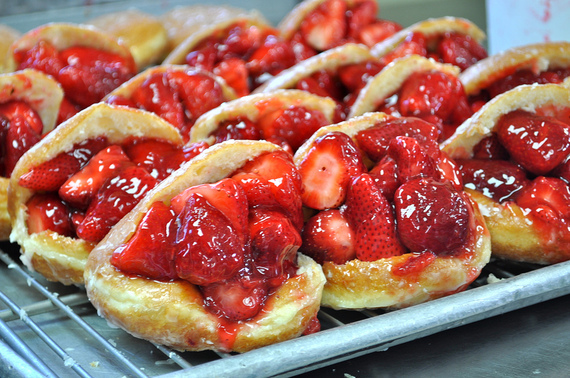 The most recent addition to donut ring is Donuts with a Difference in Medford. With its retro storefront and fan favorites like the coconut dusted or pipin hot glazed classic, its competing with Union Square for Donut supremacy. The bright lights of LA haven't destroyed the olde time goodness of LA donut shops. The retro feel of favorites Stan's Donuts, Bob's and Primo's celebrate the nostalgia of sinking into a bear claw or cakey maple glazed treat. The top crowd pleaser may be further afield at The Donut Man where the tiger tail's chocolate and vanilla swirled magic is something to be voraciously devoured, aggressive sizing be damned. I know I'm cheating by lumping these boroughs together, but since you can hit multiple donut shops in a day by train, I'm calling that acceptable. Back to the goods... Doughnut Plant for Manhattanites is a place of many a Sunday morning pilgrimage while Dough, a Bed-Stuy operation with a Manhattan outpost, has skyrocketed to the top of the donut game (foursquare voted it the best Donut shop in the country for 2015). With options like Chocolate frosted with Cocoa Nibs and Passion Fruit, New Yorkers have gone absolutely nuts for these donuts. Bonus: For the allergen aware, Babycakes NYC is one of the top donut shops for the gluten free, dairy free and vegan crowd. 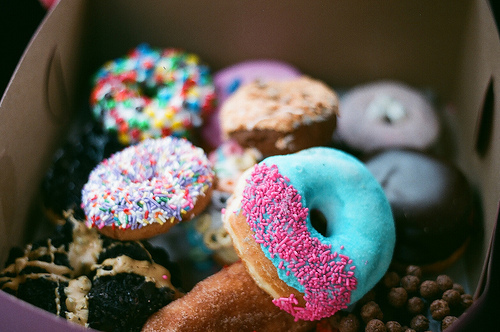 Donuts for Everyone! Popularized by VooDoo Donuts with their Cap'n Crunch covered and Nyquil tinged options (since banned by the FDA), Portland is home to some of the trendiest, tastiest Donut shops in the nation. Also making the highlight reel are Pip's Confection's simple Sea Salt and Honey (Call me a minimalist at heart) or Blue Star Donuts' Cointreau Creme Brulee. "In donuts we trust" should be in the running for a new state (or at least city) motto and we love you Portland for your excellent frosted, glazed and sprinkled treats. 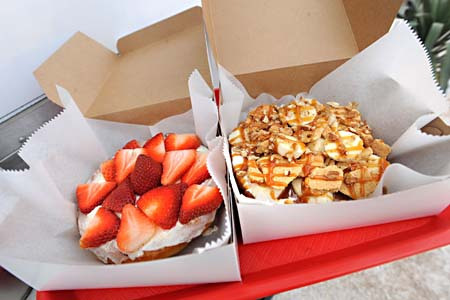 Honorable Mentions: Seattle, WA and Denver, CO. You guys are giving donuts great love as well... keep up the good work!